Slip Rings & Slip Ring Assemblies for precision instrumentation & power applications from Fabricast, Inc.
Our complete line of stock slip ring assemblies to accommodate most applications. Includes our BEST COST & BEST DELIVERY series of both self contained and separate rotor & brush block slip ring assemblies. Suitable for power and instrumentation. Replace worn brushes on Fabricast slip rings or design our silver graphite leaf and plunger brush assemblies into your application. Common uses include low noise instrumentation and power applications with brush grades for various environments. 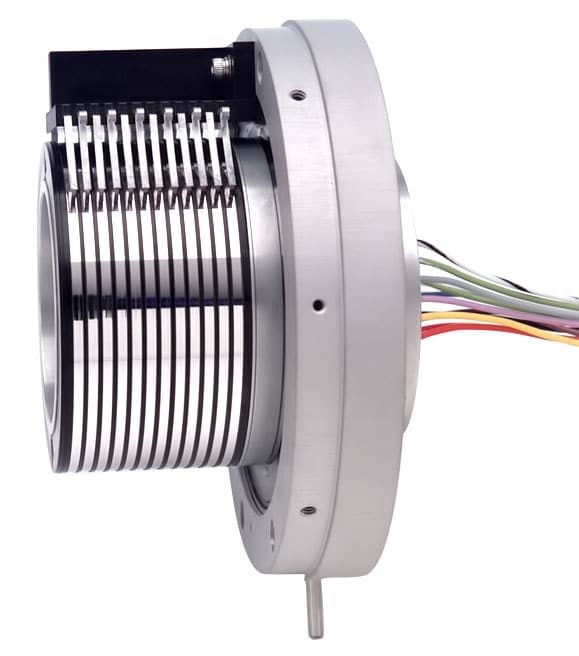 Custom Assemblies are required for applications in which a stock Fabricast slip ring does not meet the customer requirements. These custom assemblies are built using standard tooling to the customers specifications and requirements. Fabricast designs and manufactures precision slip ring assemblies for instrumentation & power applications. Slip Rings are electromechanical components used to transmit electrical signals (e.g. analog, digital, Ethernet, video, thermocouple, strain gage, etc.) and power across a rotating interface. Stock slip ring units are available for a wide range of industrial, commercial, and military applications. For more detailed information on our product line, the complete Fabricast catalog or any portion of it can be downloaded in PDF format. The Slip Ring Specification section of the website includes information on how to specify a slip ring assembly and a form which can be filled out and sent to Fabricast via Email directly from the website.